EquiLix Performance Intake (PI) is a free choice non-molasses, non-starch lick block, formulated especially for horses, donkeys and mules. This lick block is intended for owners seeking higher product intake for horses, donkeys and mules working, in competition or for picky eaters that do not consume the standard EquiLix at the necessary rate to provide nutritional benefits. 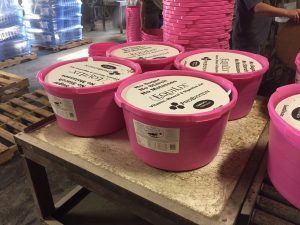 The standard EquiLix tubs are designed for a target 1lb per animal per day (per 1,000lb body weight). EquiLix PI may be up to double this rate. It comes in two sizes: 50lb suitable for 1-2 horses and 125lbs suitable for groups of 4-5 horses. 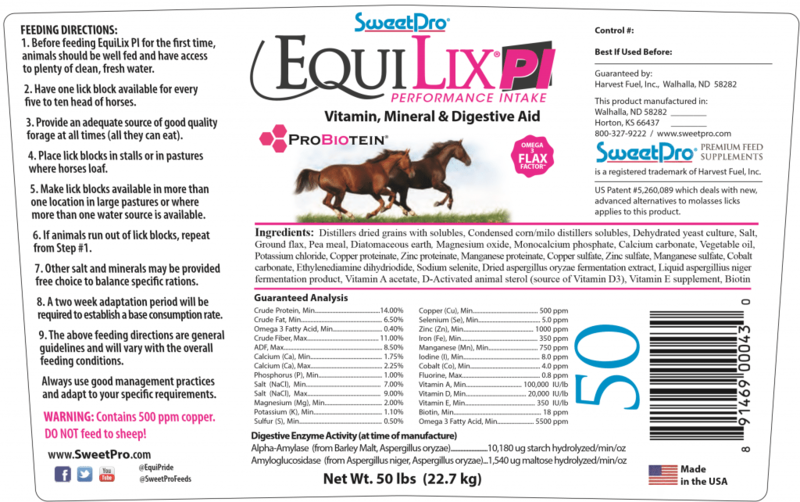 All our SweetPro products, including EquiLix PI, break from the tradition of molasses blocks, and provide your horses with healthier supplements that help their digestive systems perform at their natural best. EquiLix PI also includes ethyl alcohol to raise palatability, enhance fiber digestion and add another non-starch energy source. This free choice version is extremely beneficial for horses with gastric ulcers. EquiLix PI provides your horse with the needed multiple small meals per day and additional calcium and magnesium to help combat gastric acid.